Day 1 in Nashville and it was SO FUN! I slept in until 10:00 (yeah, jet lag baby, gotta love it! I had to TEAR myself out of bed, I could have slept another 5 hours! A 35 hour day will do that to ya;) Then I had lunch with Jessica at the Olive Garden! OMG Soup, Salad, bread sticks, and friends=HEAVEN! It was so fun:) Then Jess took me to TARGET (It was amazing Christy, just like we remembered, lol!) and Michaels and JoAnn! 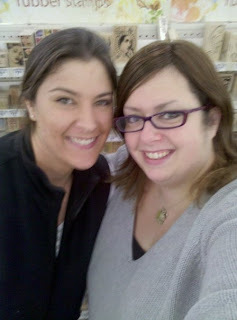 Here's a picture Jess took of us on her camera phone in front of the stamps at Michaels, SO appropriate! 8 paper pads, some primas (the two prima bottles, two ADORABLE stamps from the Greeting Farm, and the awesome card are from Jessica, she is seriously the SWEETEST thing EVER!) and a bunch of other goodies! Tomorrow I plan on hitting the Opryland Mills, a big mall right across the street! Oh yeab baby, momma needs another suitcase, lol! Okay, I'll have more pics later this week but It's 10:00 and 7:00 am is going to come super early! Hey there! It's a lovely day for some Unity, doncha think? ;) I'm using my February KOM, Nothing but Blue Skies! I really love this sweet bird, he's so fun to paper peice! I used papers by October Afternoon and cardstock, ribbon, and buttons by PTI! I have a friend over right now so I gotta run! I just had to make sure I didn't forget to post, lol! Check out the Unity Blog for today's specials and a list of the rest of the DT girls playing along today! Hope you have a MARVELOUS Friday-eve! PS--Christy, ya like how I used NO nesties? ;) Christy is babysitting all my nestabilities while I'm gone for the next two weeks and I thought I might die tonite without them, but I didn't, lol!!!!!! Whodathunk? Craziness, that's what it is! And this card STILL took forever, lol! 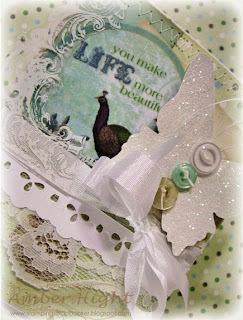 If you haven't noticed, I'm trying my hand at a new style and I'm loving all things vintage and shabby:) Yesterday I was just going through some old paper deciding what to throw and what to keep and found this old paper by Bo Bunny and just loved the color combo! So I started throwing things on my desk that I thought might match, including the awesome cloth scrap by Webster's Pages! 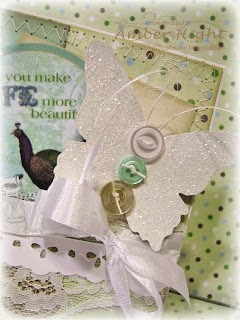 I also used a fun Hambly frame, chipboard butterfly (SU!) die, buttons, lace, ribbon, sewing, all of my favorite things! Have you been watching the American Idol Hollywood week? 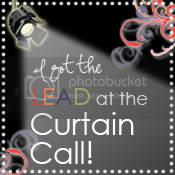 Well they're narrowing down the top 24 right now, and the commercial is over so I gotta go, lol! See ya tomorrow! Unfortunately, NOT for me:( I went over to Christy's house to stamp with her and Missy so I just loaded a bunch of stuff into my car, made a couple kits to create the following cards with using Jen D's SFYTT and Karen G's Sweet Sunday Sketch, and completely forgot that today is MONDAY and the Monday Chicks were creating something using NEW goodies! Well, besides the fact that I forgot, I really don't have anything new anyways, I've been on a spending freeze for the past 2 or 3 weeks so I could save all my money for my trip to the states! I leave on Saturday and I'm SO excited! 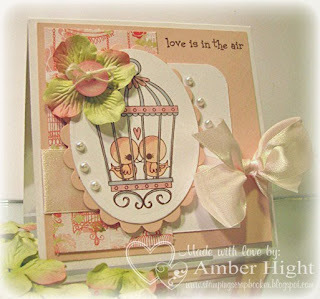 This is the card I made using this weeks Sweet Sunday Sketch! I wanted an excuse to use Blooming Button Bits by PTI again:D The papers are from BG's Porcelein paper pack, I'm almost out of it, eek! Still on a kick with my Melissa Frances paper! I can't get over how gorgeous these papers are, they just make me happy! 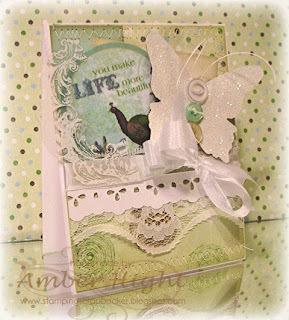 And add to that the fact I used my favorite stamp set ever, Love's Flower by Verve, and used some gorgeous lace, I just adore this card! The houndstooth stamp is a scrapblock from Cornish Heritage Farms. I was lying in bed last night and all of a sudden, visions of Ripe Avacado houndstooth on Rustic Cream cardstock jumped into my head! I just got up right away and stamped the houndstooth so I wouldn't forget in the morning, lol! Thank goodness I was able to pull this card off, it was going to happen today, even if I had to stay awake all night! Okay, now that you got an eye-full of my "not-so-new" stuff, head on over to the rest of the chicks' blogs and see what they've been up to! Also, if you haven't had a chance yet (and you're a FAN CLUB Member) you gotta check out the new DD gallery! The theme this month is Bold, Masculine, and DIRTY! There are so many amazing masculine cards in that gallery! I know I personally struggle with this theme everytime I think about it, but I have to admit that after dedicating this past month to all things manly, I'm a little more comfortable with it! Also, go check out the new Dirty Girls and congratulate them! 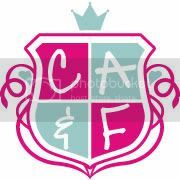 THey really deserve it, they had a really tough first gallery and hit it out of the ball park! 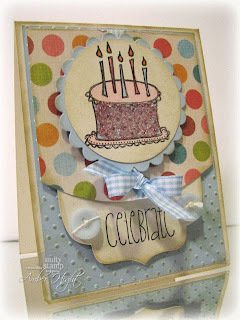 Today, a bunch of Bellarific sweeties are bringing you some fun Stamping Bella projects! The theme for today's hop is LoVE, SWEET lOve! This is a 4.25x4.25" card. 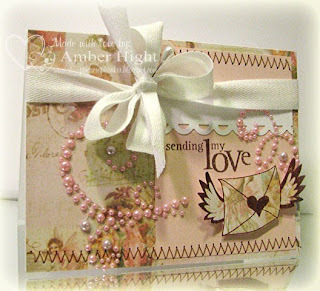 The card base is white and then I have a piece of Sweet Blush cardstock layered on top. That gorgeous dp is from Basic Gray from the Porcelien paper pack! It has bird cages on it and they actually match pretty well! I colored the birds and the cage with my Copics. That big ole' beautiful ribbon is from Faith's store, Mark's Finest Papers. This ribbon ties like a DREAM! I normally don't like wide ribbon because the knots are too big and it's hard to fit stuff on the card close to the ribbon. Not a problem with this stuff! Also, to girly it up even MORE, I added some white pearls by Melissa Frances and a Prima Hydrangea flower with a button center! How is this for a sweet card? Probably a little too girly for DH, so I'll just sit it on a shelf and stare at it, ha! Well thank you SO much for hopping by my little blog! I love visitors:D Your next stop on the hop is the sweet and talented EM! Go on and show her some Bellarific LOVE! This first card was SO fun to make! Just the other day, Billy, my darling, honest, husband, told me that I should think outside the box and make cards that don't all look the same, lol! He was particularly concerned with how I don't do any cool folds (his mom sent us a Christmas card that was sort of a gate fold style, and he loved it, lol!) so this card is in honor that funny moment, lol! 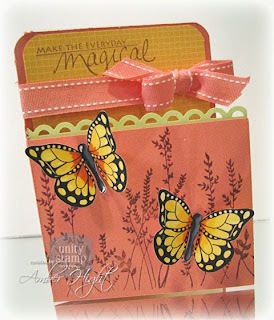 I glued some Summer Sunrise Bitty Box dp on the inside and stamped the "magical" sentiment from the 2009 November KOM, "Simply Magical"! You'll noticed I blurred the sentiment on the inside of the card. That's because it's from a different stamp company! This is going to be my folks' Anniversary card and I didn't have a Unity anniversary sentiment. Okay, this next card is Asian inspired! 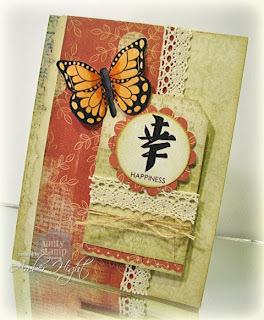 As soon as I saw this kit, I was instantly drawn to the Asian inspired stamps! There are sweet little paper lanterns, these Kanji stamps, the trees, it's all so beautiful! The color combination is also sort of Asian inspired, I find alot of browns and oranges over here in the art, china, pottery, you name it! These papers are from Pink Paisley and the Vintage Moon collection. Ya see that purdy butterfly again? :) I'm all about butterflies lately! Maybe it's cause spring is a-comin! Well, it's pretty much spring here, but for you poor peeps in the states, with all that snow, you probably won't see any butterflies for awhile, lol! So do you love this kit? Scroll to the bottom of THIS page to find all the lovely stores that carry this kit! Remember, you can't buy it from the Unity store, so get to shopping! I still don't have my KOM so unfortunately I don't have any fun KOM creations for you, but I DID pull out my favorite bday set, "It's Your Day" I used this weeks Mojo Monday sketch for the layout, isn't if fun? I love the polka dot paper! It's from MME in the collection called Garden Party. You can't really see the sparkle, but I used some pink glass-shard glitter on the cake, it's super sparkly! 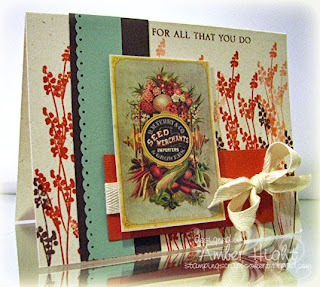 I aged the card a bit with Old Paper Distress Ink, it's one of my fave distress ink colors. 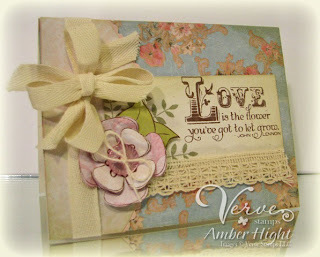 JUST enough dirty to make it look soft and vintage:) The ribbon is Spring Rain by PTI, as is the blue cardstock! Make sure you stop by the Unity Blog to see what kind of fun and sales Angela has waiting for you! You'll also see a list of the other DT girls who have worked hard to bring you more fabulous-ness:) MWAH and have a GREAT day! I played in today's sketch challenge on SCS! This was a super fun sketch challenge, if you have time, head over to the thread and PLAY! I wish the colors in my photo were better, but it's a little yellow:( Bad lighting, that's what I blame it on! 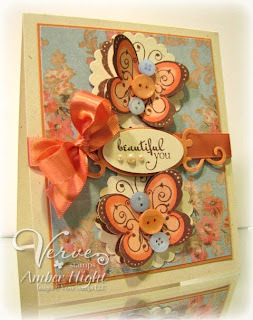 I pulled out Beautiful Kindness and Celebrating You by Verve for this sweet little card:) Aren't those butterflies fun? There is also a smaller butterfly in this set, which I started with, but they were much too small and it made this card really unbalanced. I'm very happy with how it turned out with the bigger butterflies (I used to call them birdieflys when I was a kid, how funny!) And I realize maybe the buttons are overkill? But ya know what, I love them and that's all that matters, lol! The sentiment (from Celebrating You) was cut out with my large oval punch (SU!) 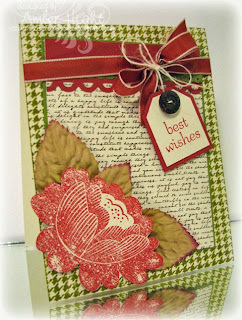 and layered on a fun tag die from spellbinders! I love how easily the ribbon slides through the flourishes:) The gorgeous paper is from Mellissa Frances, so dreamy and perfect! Have a fabby day, ya'll! I don't know what you did in your craft room today, but I was inspired to play in a couple color challenges! 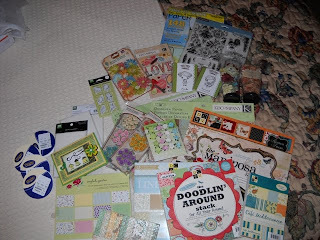 First off, I have my eyes honed in on the PTI blog permanently these days, every day Nichole brings FANTASTIC sneak peeks of new products, stamps, and challenges! I am seriously so excited for the 15th (my credit card, not so much, lol!)! Today, Nichole announced new ventures by Heather Nichols and Dawn McVey! Oh, I'm totally ecstatic about these! 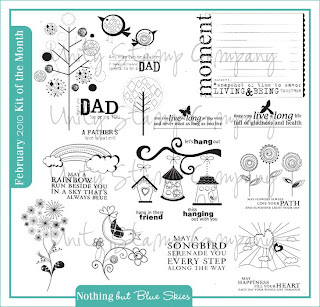 I'm so happy to be getting my PTI stamps inky lately, they're so beautiful and FUN! I know I promised Verve today, but my inspiration took me in another direction, and like a man, I didn't think anything of it, lmao! Oh that was mean! Okay, I seriously need to pick up dog toy guts from all over my house! Christy's and my dogs have been having *WAY TOO MUCH FUN* together! I don't think there is a toy left in tact, lol! Whatever keeps them happy, there are alot more of them than me, I don't want them turning against me! HA! Even though I buy up all the stamps, faithfully, every 15th of the month, I don't pull my PTI stamps out often enough! Well, my dear sweet husband left this morning for a 2 month deployment to the Phillipines, so I had to console myself with some stamping therapy:) PTI is having an AWESOME countdown for their 3rd anniversary release and there have been challenges every day! So I got a couple of those done, plus the new CPS sketch that PTI is sponsoring! I'm so excited about the new 100% felt that PTI will be carrying, so I broke out some felt from my own stash:) I cut it twice with my scalloped heart nesties and then nested a Rustic White heart inside, with a sentiment from Say it with Style. 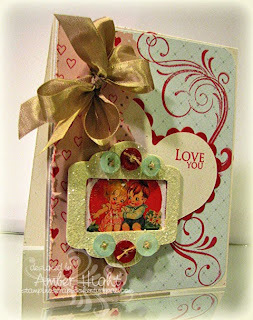 The background is stamped with the text background from Background Basics: Hearts! Fun right? See what the other Monday chicks came up with for this month of love! AJ, Brooke, Jimmi, Maren, and Jeanne! 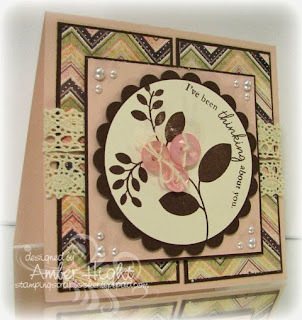 My next card is for the emboss resist challenge that Nichole issued a few days ago! 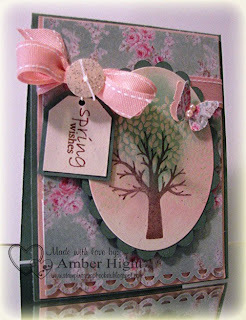 I used the new Through the Trees set for this card, along with some Melissa Frances papers. I embossed the leaves with clear ep and then sponged some pink and ocean ink (Versamagic) chalk in on top and wiped away the excess, I love the effect it has! 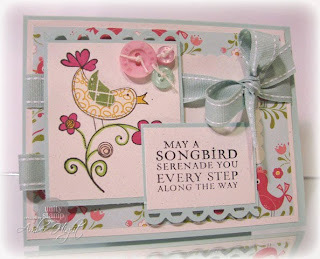 The sentiment is from Lisa Johnson's new set, Daily Designs Additions. Last card for today is for TODAY's PTI challenge, Paint by numbers! How fun is that! 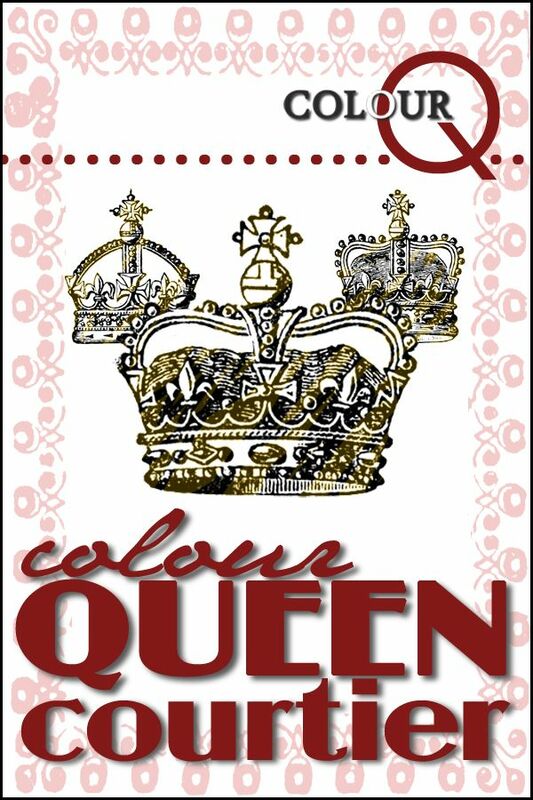 I actually had a hard time with this color combo, 5 colors is a lot to cram onto a card, lol! But I managed, and I'm happy with what I came up with! My username on PTI is......go ahead and guess....... AMBER! I know, I'm way creative, and so proud:) Ha! So based on my username, the colors I had to work with are Ocean Tides, Spring Moss, Lemon Tart, Vintage Cream, and Kraft! Love these colors, but like I said, it was a challenge getting them all on! So if it looks like a couple of the colors were after-thoughts, they sorta were, lol! 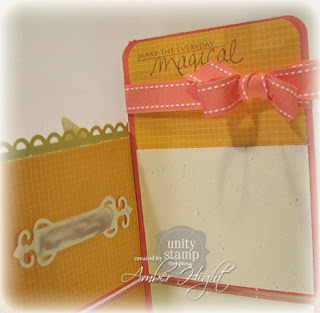 I embossed the vintage cream piece with my cuttlebug ( I forgot the name of this folder). I think it gives it a more "natural" feel:) I also used some of the new Pretty Pastels dsp (the spring moss piece). The stamps used are Turning a New Leaf and Say it with Style! Well there it is! I'm turning in for the night, Christy's two labs plus my two labs are wearing me down, lol! They're a fun bunch, but holy crap they're little bundles of energy! See ya tomorrow with...I don't know...something, probably some yummy VERVE! Unfortunately, I don't have my stamps yet so I had to play with my OTHER favorite, Lovely Bits and Baubles! I am LOVING this fun new kit! It's not available YET but will be SOON! I decided to go a little shabby today, mostly because I don't have my mojo with me and I love how ANYTHING shabby is AWESOME, lol! I didn't even have to try to hard, lol! 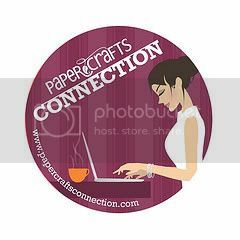 The dp is from "The Very Thought of You" by Sweet Shoppe Designs! I printed it on HP Everyday Matte photo paper:) Also got to use some of my new Prima bling! I love this stuff, I thought it was going to be hard to peel off the acetate sheet and that it would break, but it came off in one piece, yeah! It's the little things that make me happy, lol! Don't forget to stop by the Unity Blog today, I bet Angela is up to something and has a good sale up her sleeve;) You'll also get to see a list of all the chickies playing today!